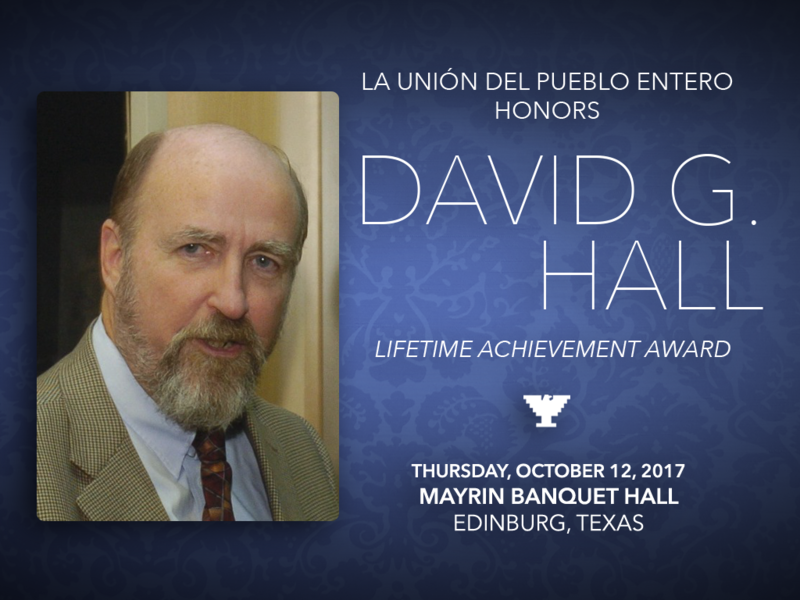 La Unión del Pueblo Entero presents: David G. Hall! David G. Hall is currently the Executive Director of Texas RioGrande Legal Aid (TRLA). He has held this position since 1975 and, under his direction, the organization has become the largest legal aid provider in Texas and third largest in the United States. Prior to working with TRLA, Hall served as the Director of the South Texas Project for the American Civil Liberties Union Foundation and was an attorney with the United Farm Workers Organizing Committee. He received his J.D. from the University of Texas School of Law in 1969. Prior to attending law school, Hall served as a Peace Corps volunteer in Venezuela. Hall has received numerous awards and recognitions for his service, including a 2007 recognition from the Mid-West Association of Farmworker Organizations and inclusion in Texas Lawyer magazine’s “Legal Legend: A Century of Texas Law and Lawyering” as one of 100 Texas lawyers who have shaped the state’s legal history. In 1996, Hall received a special recognition from United Farm Workers of America, the César Chávez Award for his outstanding service to farmworkers. Hall was honored by the State Bar of Texas Poverty Law Section with the first Noble Award in Poverty Law in 2008. In 2010, Hall was named one of the 25 greatest Texas lawyers of the last quarter century by Texas Lawyer. In 2011, the White House recognized Hall as part of their Champions of Change initiative for dedicating his career to closing the justice gap. Under Hall’s leadership, Texas RioGrande Legal Aid has received numerous awards and recognitions including being named 2008 Impact Player of the Year by Texas Lawyer. After a lifetime of service to justice, David Hall is set to retire soon, after dedicating decades to the Farmworker Movement. La Unión del Pueblo Entero presents: Ed Krueger! Ed Krueger was ordained a Minister in 1958 in the United Church of Christ and went on to do missionary work with them in Honduras from 1958-1961. After that, Krueger began working as a Pastor in Oklahoma for the Presbyterian Church while working with the Southwest Oklahoma Migrant Ministry. This work would continue for five years leading him to his calling in South Texas. 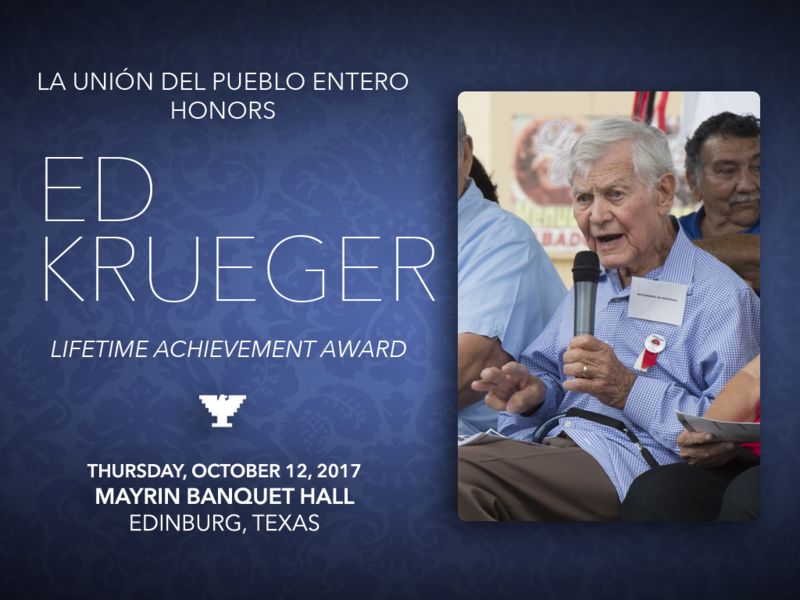 In the Fall of 1966, Krueger moved to Edinburg, TX and began working with the Edinburg Migrant Program in the school system. During this time, he began going to Rio Grande City, TX to support the farm worker strike and fight against the violent and racist Texas Rangers. Krueger’s testimony was instrumental for the Texas Council of Churches in their suit against Captain Allee and the Rangers, helping to end their brutal practices. Krueger went on to work with the National Farm Worker Ministry between 1972-1973 alongside César Chávez in California. In 1979 Krueger established the Comite de Apoyo (Support Committee). The Comite de Apoyo was successful in obtaining grants to hire organizers and conduct educational workshops. He was instrumental in the 1992 U.S. News & World Report which published a seven page spread with photographs of companies dumping their waste into canals that went through the city of Matamoros, Mexico. After the publicity, the company built a water treatment plant for all its maquiladoras. In 1998, the Comite Fronterizo, a non-profit Mexican organization, was formed in Piedras Negras/Ciudad Acuña to continue Kruger’s work. It was established with the help of the AFSC and Krueger, who had organized these women and empowered them to be independent. Ed Krueger is a person who has never wavered in his Christian beliefs and sense of justice. He is an ordained minister who has shared his sense of Christian responsibility throughout his career and his personal life. Krueger has a spiritual calling to work for a better tomorrow.